Georgia passed state Prohibition in 1907, with Ray City’s own Jonathan Perry Knight among those leading the charge, and did not repeal it until 1935. Prohibition didn’t stop drinking in Ray City. There were plenty of “blind tigers” running stills and selling liquor in Berrien County, despite the efforts of lawmen like Jim Griner, Bruner Shaw and Cauley Shaw. 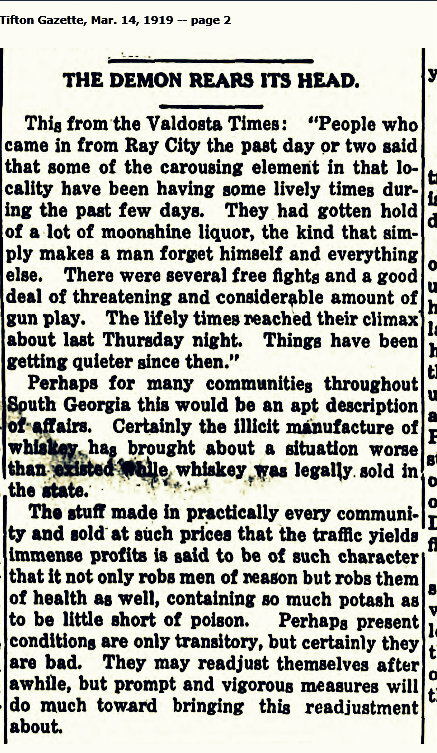 In 1919, reports of drunkenness and lawlessness in Ray City were making newspapers throughout the section. Bootleg alcohol in Berrien County, 1919. The Demon Rears Its Head. Perhaps for many communities throughout South Georgia this would be an apt description of affairs. Certainly the illicit manufacture of whiskey has brought about a situation worse than existed while whiskey was legally sold in the state. The stuff made in practically every community and sold at such prices that the traffic yields immense profits is said to be of such character that it not only robs men of reason but robs them of health as well containing so much potash as to be little short of poison. Perhaps present conditions are only transitory, but certainly they are bad. They may readjust themselves after awhile, but prompt and vigorous measures will do much toward bringing this readjustment about.